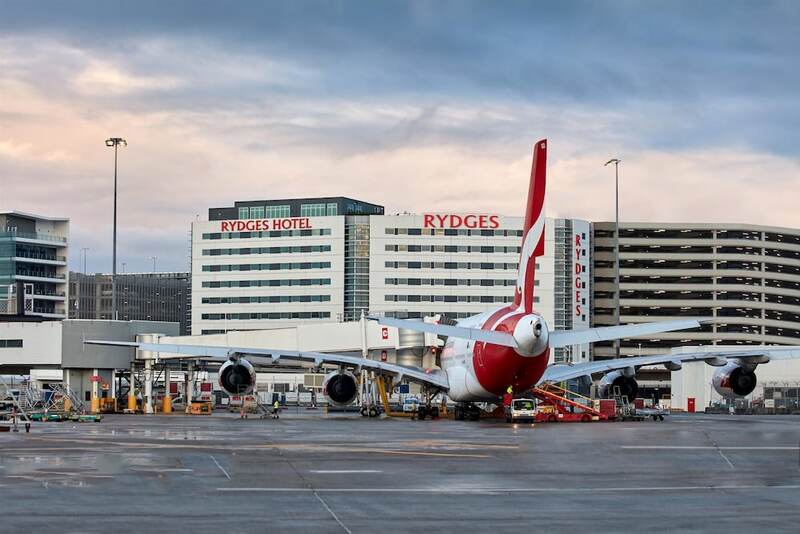 With a stay at Rydges Sydney Airport Hotel in Mascot, you'll be connected to the airport, and 5.4 mi (8.6 km) from University of Sydney and 7.6 mi (12.2 km) from Coogee Beach. This 4-star hotel is 9.8 mi (15.7 km) from Hyde Park and 10 mi (16.1 km) from Sydney Town Hall. Make yourself at home in one of the 318 air-conditioned rooms featuring minibars and LCD televisions. Complimentary wired and wireless Internet access keeps you connected, and cable programming provides entertainment. Private bathrooms with showers feature rainfall showerheads and complimentary toiletries. Conveniences include phones, as well as laptop-compatible safes and desks. Enjoy recreation amenities such as a 24-hour fitness center or take in the view from a rooftop terrace. Additional amenities at this hotel include complimentary wireless Internet access, wedding services, and a television in a common area. Stop by the hotel's restaurant, Blackwattle Grill, for dinner. Dining is also available at the coffee shop/café, and 24-hour room service is provided. Need to unwind? Take a break with a tasty beverage at one of the 2 bars/lounges. Buffet breakfasts are available daily from 5 AM to 10:30 AM for a fee. Featured amenities include complimentary wired Internet access, a 24-hour business center, and express check-in. Planning an event in Mascot? This hotel has 9168 square feet (852 square meters) of space consisting of a conference center and a meeting room. A roundtrip airport shuttle is complimentary at scheduled times. Blackwattle Grill - This restaurant serves breakfast and dinner. A children's menu is available. Open daily. Touchdown Sports Bar - This bar serves lunch, dinner, and light fare. Guests can enjoy alfresco dining (weather permitting). A children's menu is available. Happy hour is offered. Open daily. Touch and Go Cafe - This cafe serves breakfast only. Guests can order drinks at the bar and enjoy alfresco dining (weather permitting). Open daily. Cloud 9 Rooftop Bar - Onsite bar. Open daily. Airport shuttle service is available at scheduled times from 6:00 AM to 10:00 PM. Fees may apply. Contact the property in advance to make arrangements. This property offers transfers from the airport. Guests must contact the property with arrival details before travel, using the contact information on the booking confirmation. One child 12 years old or younger stays free when occupying the parent or guardian's room, using existing bedding. The property has connecting/adjoining rooms, which are subject to availability and can be requested by contacting the property using the number on the booking confirmation. Book a stay in any room or rate category and receive free domestic transfer service. Must book rate plan to receive benefits. All hotel guests receive a free transfer service to or from the domestic terminals with a voucher obtained from the hotel before arrival. No transfer is required for international flights, as the property is located near the terminal. Full details at check-in. Guests must contact the hotel directly with their flight details to arrange pick up and to claim voucher prior to arrival; contact information is provided on the booking confirmation email. Service is available 5 AM-10:45 PM. Offer subject to availability. Offer is not valid with groups/conventions and may not be combined with other promotional offers. Other restrictions and blackout dates may apply.